Tucked onto Deck 4 near the Breeze's teen club, this new-for-Carnival, 24-seat venue offers a high-tech escape for adults as well as kids. Combining 3-D projection technology with motion simulation, it's home to short productions under 30 minutes. Moviegoers wear special 3-D glasses, and special effects include squirting water and blowing air. Tickets costs $7.95 per person for a single entry, but an unlimited entry ticket is available for $14.95. You don't have to be a child to appreciate the appeal of this sprawling water play area -- one of the largest at sea. Looming above the ship's main pool deck, WaterWorks offers two water slides that rival anything found at a land-based resort: The scream-a-minute, 312-foot-long Twister and the towering, funnel-style DrainPipe. There's also two side-by-side miniature slides aimed at the littlest tots and a 300-gallon "dump bucket" that sends water cascading over a wide area when you least expect it. In short: Prepare to be soaked. As if WaterWorks wasn't enough deck-top fun for one cruise vacation, Carnival has devoted another generous chunk of the ship's exterior space to this smorgasboard of gee-whiz amusements. 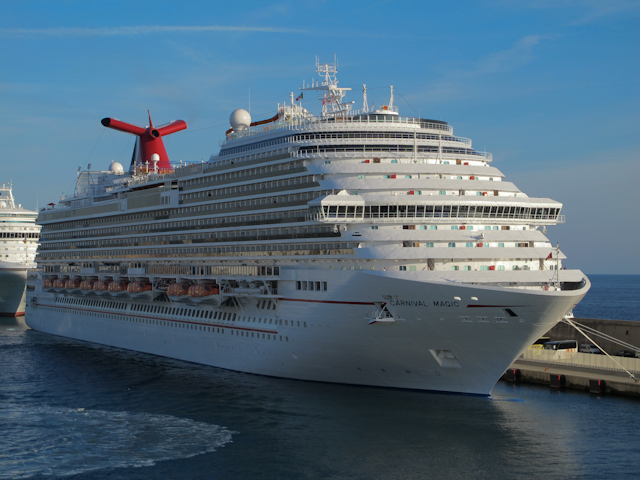 Among the attractions is a suspended-in-the-sky ropes course and an outdoor weightlifting area -- new-for-the-industry concepts that first debuted last year on the Carnival Magic. SportSquare also offers a two-level miniature golf course; a jogging track; Vita exercise course; ping pong and foosball tables; and a lighted multi-purpose court designed for basketball, volleyball and (so they say) soccer. Learn more about Breeze here: www.carnival.com/breeze. I posted, about a month ago, about adventures in the Bahamas, READ IT. I spoke about sailing, camping and pigs. Yes, pigs. I'm still doing research and came across this clip proving that pigs really do swing around in paradise. Why are they here? Do they really just hang out and swim around? All questions I'm going to research. As far as the trips concerned, I'm going, for sure!